Choo Shinn Chei. Back onto camera : Chen Xin. On 10 March 2013, Yong Siew Lee, Ang Pei Shan, Chen Xin and I left Johor Bahru and headed north to a Hindu temple in Rawang. We dropped by Bangi to fetch Nyam Kee Han who furthers his Masters Degree in UKM and had lunch together in Bangi. Five of us attended a prayer ceremony for the launching of Waytha Moorthy’s Hunger Viratham in a temple in Rawang. We arrived earlier not only to show Sahabat Rakyat’s support towards Hindraf’s struggle, but also to meet and have a conversation with Waytha Moorthy before his Hunger Viratham began. We intended to have a better understanding of Hindraf’s future direction under the current circumstances. We heartily expressed our opinion on the related topics as well. Waytha Moorthy shared with us about his several prospects of the poor Malaysian Indians’ struggle against the racist rule. In my view, some of the content brings about practical significance to the struggle of the Malaysian people against the racist rule, especially the struggle for the fundamental rights of the Indians and the other minority communities. The ideas are worthy of reference to the democratic parties, groups and individuals. 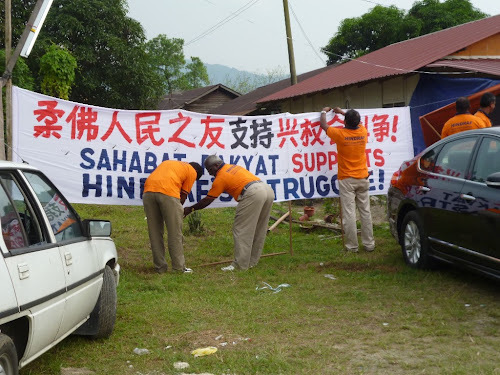 (1) Hindraf is an NGO fighting for the rights of Indian poor through mass struggle. Hindraf intends to actively participate in the parliamentary struggle to resolve the marginalized dilemma hitherto faced by the Indian community. There is a need for Hindraf to introduce their candidates of peoples’ representatives (wakil rakyat), who have deep understanding on marginalized Indian community to the Parliament. They will call for just demands, and to put forward the core demands of Hindraf opposing institutionalized racism to the Parliament as urgent agenda. They hope to gain support internationally by lobbying governments and the masses abroad, in order to find a way out for the Indian poor in Malaysia the soonest possible. (2) Waytha Moorthy made it very clear that Hindraf is a NGO (non-governmental organization) fighting for the rights and dignity of Indian poor, whereas Human Rights Party (HRP) is a political party for certain class or certain stratum of a society to realize their political goals. Hindraf and HRP are completely different groups which cannot be equated. Waytha Moorthy had informed media numerous times that Uthayakumar, his brother, is not the de-facto leader of Hindraf, this includes officially re-informed Free Malaysia Today and Malaysiakini few days back, but they just ignored it. They seem to create the confusion deliberately so that Hindraf will always be misunderstood and ostracized. (3) As the 13th General Election is looming, Hindraf is very keen to work hand in hand with Pakatan Rakyat (PR). 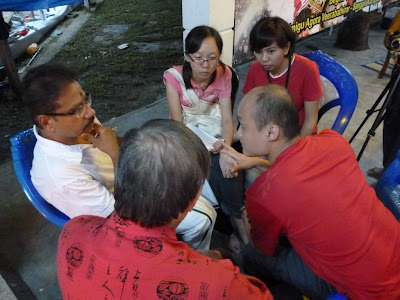 Hindraf had organized 17 official and unofficial meetings with PR’s leaders over the past few months. Nowadays Hindraf gains wide support from the Indian masses, especially in some states with high Indian population. As long as PR endorsed Hindraf’s 5-Year Blueprint in a clear binding way, Hindraf will mobilize their cadres around the country to campaign for PR and call upon the people especially the Indian community to vote for PR. In the mixed constituencies consist of significant proportion of Indian voters, Indian votes will play a decisive factor, Hindraf will definitely make contributions towards the victory of PR in the election. (4) Waytha Moorthy requested direct response from PR on the 5-year Blueprint. 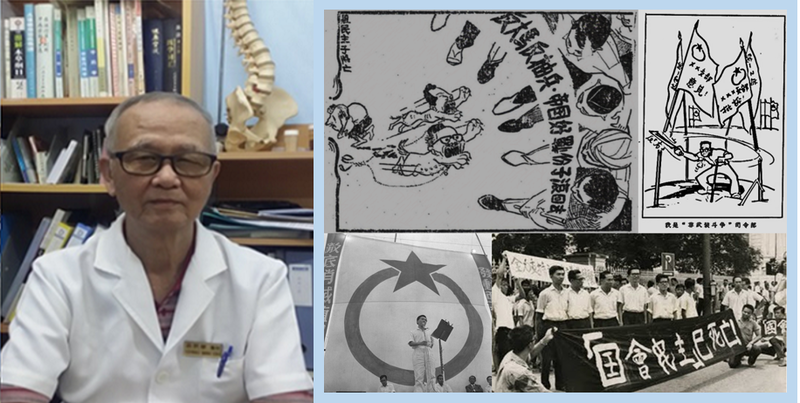 He used the complete failure of Chinese organizations’ ‘Su Qiu’ (demands) in 1999 as an example to explain why Hindraf must get a binding commitment from the coming-to-power political party before the general election. 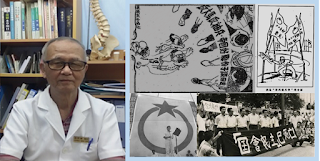 In the year 1999, Mahathir, the former Prime Minister, verbally promised and endorsed the ‘Su Qiu’ before the election but then “settled old scores” after the election. Hindraf will no longer convey unconditional support to the opposition parties as what they did in 2007, especially in the current political situation which is stern, complicated and changes frequently. In fact, he would very much like to listen to the views from PR’s leaders about the 5-Year Blueprint, and is prepared to make some adjustment, but PR’s leaders have not given any official response till today, which has caused great disappointment of Hindraf towards PR’s leaders. (5) He and his fellow leaders realized that there are only Chinese populations who rise up against the racist rule in the past that resulted in repeated failure. The Indian community is unable to fight for the fundamental rights and defend their ethnic dignity in isolation. In order to succeed, they have to unite with the other forces from the other ethnics that struggle for democratic rights and promote social reforms. Otherwise, the struggle will suffer crushing defeat. Therefore, he attaches importance to the cooperation with Sahabat Rakyat and feels grateful that we arrived at the scene to show our support to Hindraf’s struggle. 1. Regarding the immediate question of how to deal with BN and PR, Hindraf has to clearly demonstrate its position. The political approach to fully satisfy the aspirations and demands of the people from various ethnics is to dump BN into the dustbin of history. This is also the political call jointly released by the Sahabat Rakyat Johore Working Committee and Hindraf Johor in the "Letter from Johore NGOs to the Johore people" upon the 13th General Election, which read “Unite! Smash UMNO Hegemony, Form a Democratic United Front.” This democratic united front does not only include the three parties in Pakatan Rakyat who are confronting BN, it must also unite all the other political parties, NGOs and individuals from all walks of life who are opposed to the UMNO-BN rule. 3. We agree with Waytha Moorthy to effectively fight for the fundamental human rights and ethnic dignity of the Indian community through mass struggle and parliamentary struggle. It would be good enough if PR leaders could allow Hindraf representatives to contest under the banner of PR in at least two (the more the better) parliamentary seats. As far as he and Hindraf persist with the non-partisan stand of a peoples’ representative organization, they will gain wide supports among the democratic parties, groups and individuals and certainly we will continue to work closely with them. If they are persistent in their stand to struggle for the rights and dignity of the Indian poor, not to entertain any illusion about the UMNO BN ruling clique, and to unite the struggle with the anti-racism forces from the other communities, it is believed that the aspirations to put forward the core demands to repeal Article 153 of the Federal Constitutions in the parliament will be materialized definitely.